176 classic covers unfurled in full-sized glory! A great bunch of WWII era comic book covers that will take you back to the days when Tesla technology ruled the world! When we contemplate a memorable old comic book, the first thing that comes to mind is its cover, and that is no accident. Publishers realized fairly quickly that if they spent a little extra to hire a good cover artist, they could fill the insides with mediocrity and still make a sizable profit—that all it took was a striking cover to entice thousands of kids to fork over their dimes. Selections from completely inappropriate and bizarre comic books like Crash Comics; Punch Comics; Hit Comics; Speed Comics; Headline Comics; Green Lama, Blue Bolt; Star Ranger; Science Comics; Weird Comics; Mystic Comics; Jungle Comics; Zip Comics; Captain Marvel; Master Comics; Scoop Comics; heaps more! Tons of great, often political in some nature, comic book covers from the golden age of the WWII era! Deluxe all-color large-format book! At the back of the book is a notes section on each issue. Published at $29.95. Our price only $18.95! ACTION! MYSTERY! 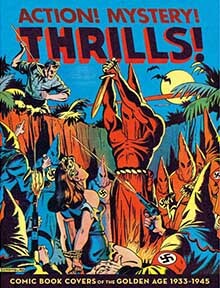 THRILLS! Comic Book Covers of the Golden Age 1933-1945 Edited by Greg Sadowski, Foreword by Ty Templeton. 208 Pages. 8x10 Paperback. All Color. Notes Section for Each Issue.